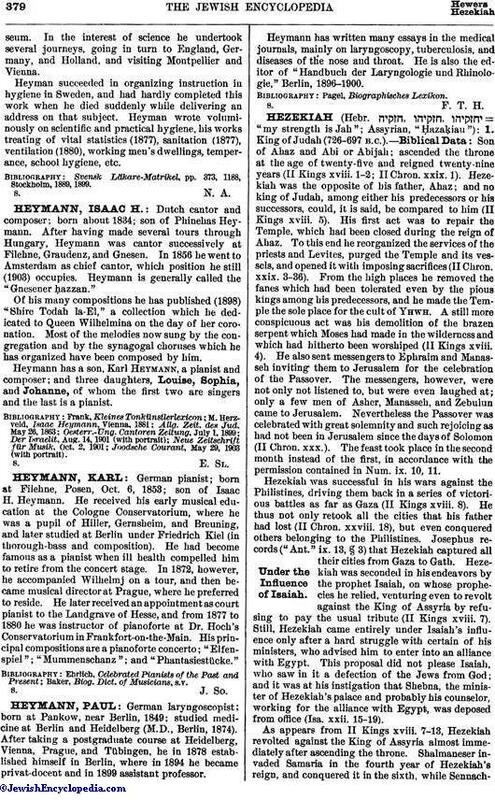 German pianist; born at Filehne, Posen, Oct. 6, 1853; son of Isaac H. Heymann. He received his early musical education at the Cologne Conservatorium, where he was a pupil of Hiller, Gernsheim, and Breuning, and later studied at Berlin under Friedrich Kiel (in thorough—bass and composition). He had become famous as a pianist when ill health compelled him to retire from the concert stage. In 1872, however, he accompanied Wilhelmj on a tour, and then became musical director at Prague, where he preferred to reside. He later received an appointment as court pianist to the Landgrave of Hesse, and from 1877 to 1880 he was instructor of pianoforte at Dr. Hoch's Conservatorium in Frankfort-on-the-Main. His principal compositions are a pianoforte concerto; "Elfenspiel"; "Mummenschanz"; and "Phantasiestücke." Baker, Biog. Dict. of Musicians, s.v.